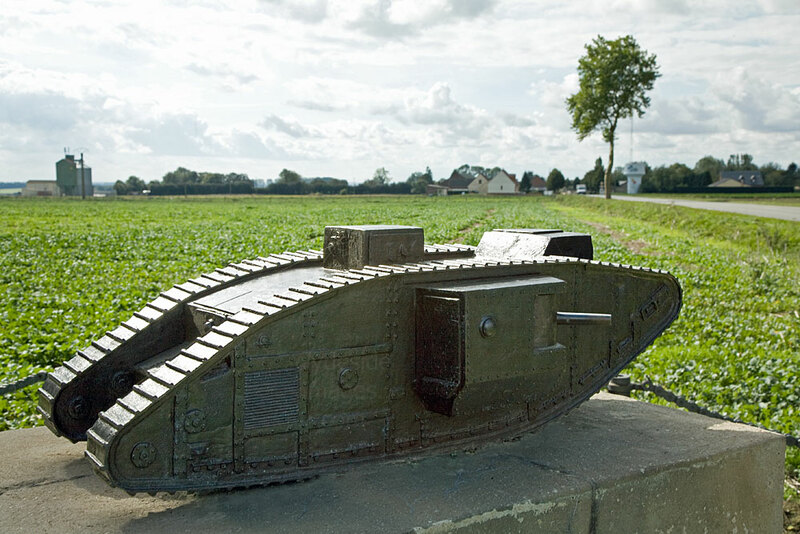 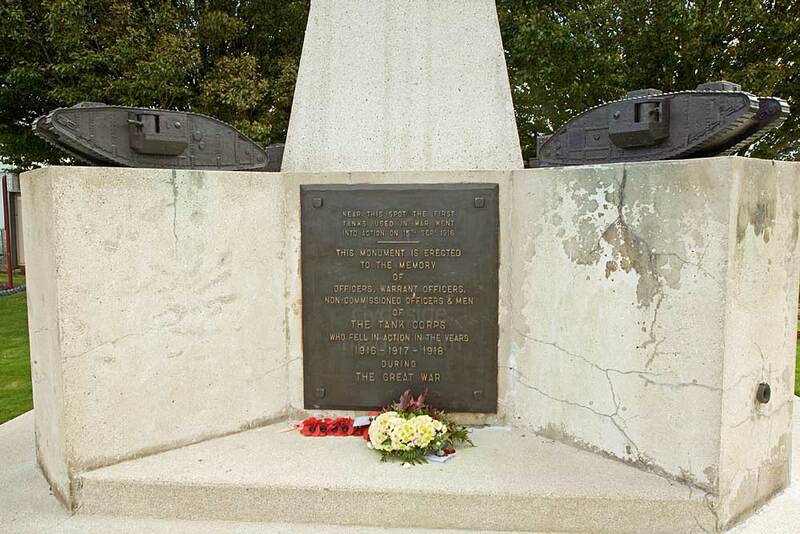 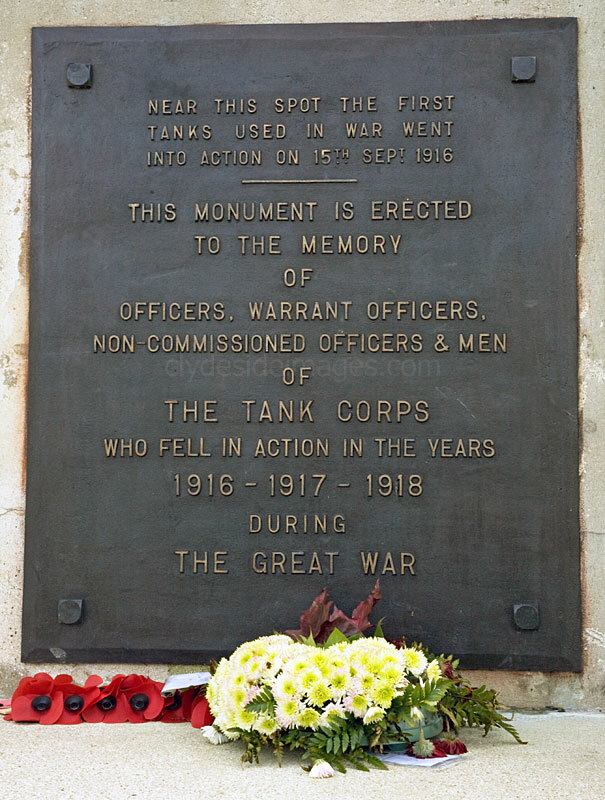 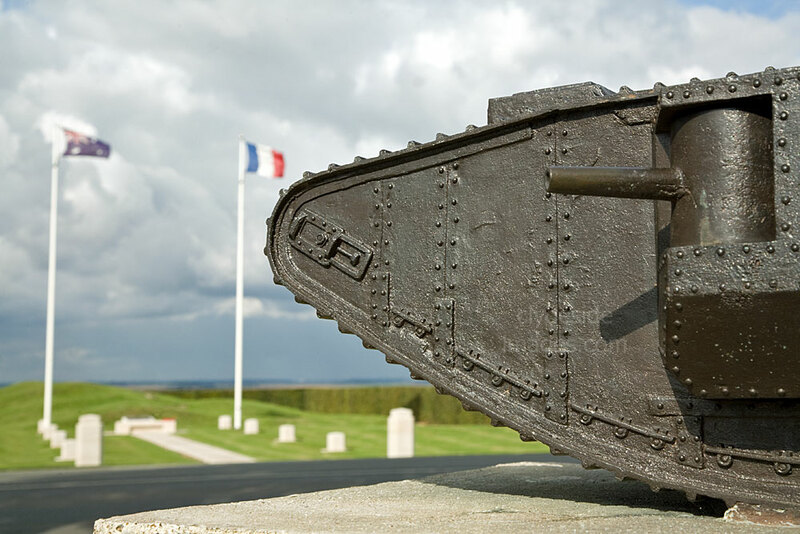 ​This memorial, dedicated to the Fallen of the Tank Corps, stands beside the Albert to Bapaume road on one of the spots where, on 15 September 1916, tanks mustered before going into action for the first time. 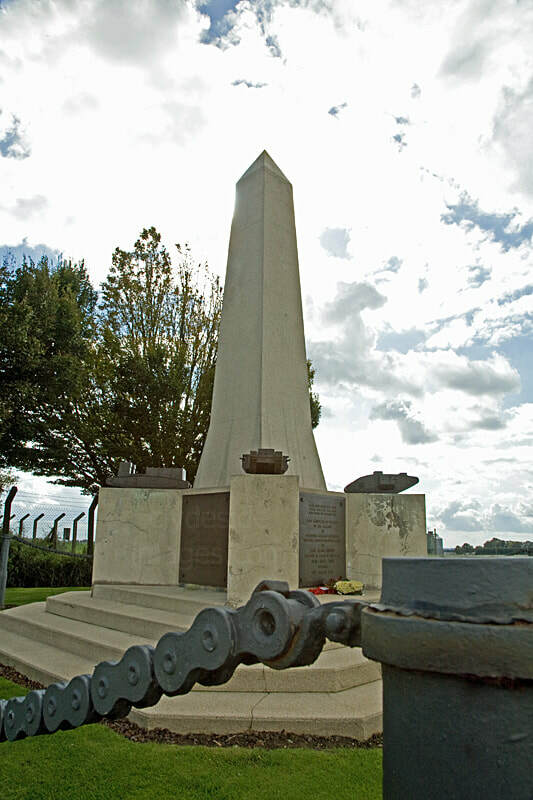 ​The memorial, on the opposite side of the road from the Pozieres Windmill site, consists of an obelisk with a base holding four miniature tanks and a perimeter fence made from 6-pounder tank gun barrels and early driving chains. The tanks featured are a Gun-carrier Tank Mk.1, a Heavy Tank MK.4, a Heavy Tank MK.V and a Medium A Whippet. 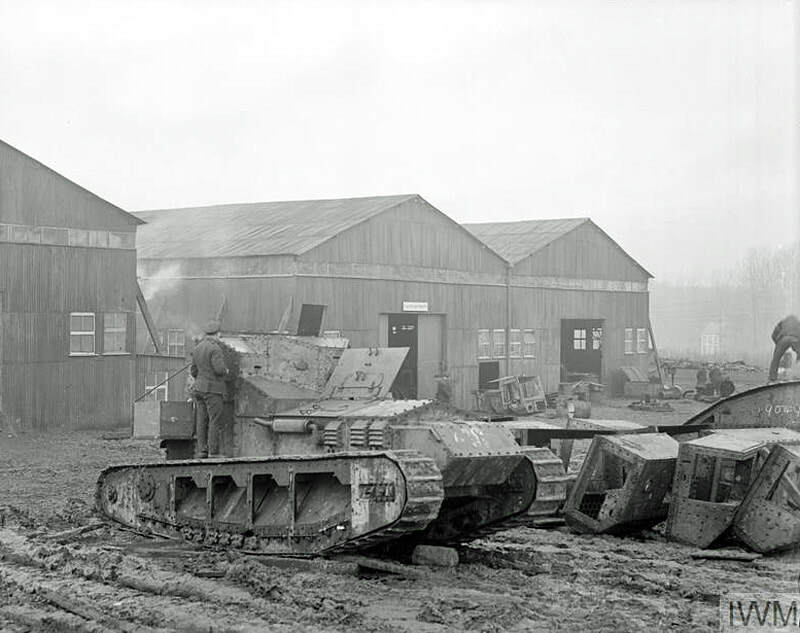 ​The Gun Carrier Mark I was the first piece of self-propelled artillery ever to be produced, a British development from the First World War. Gun carriers were first used in the Battle of Pilckem Ridge (31 July – 2 August 1917) during the Third Battle of Ypres, but it`s likely that none of them ever fired a shot. 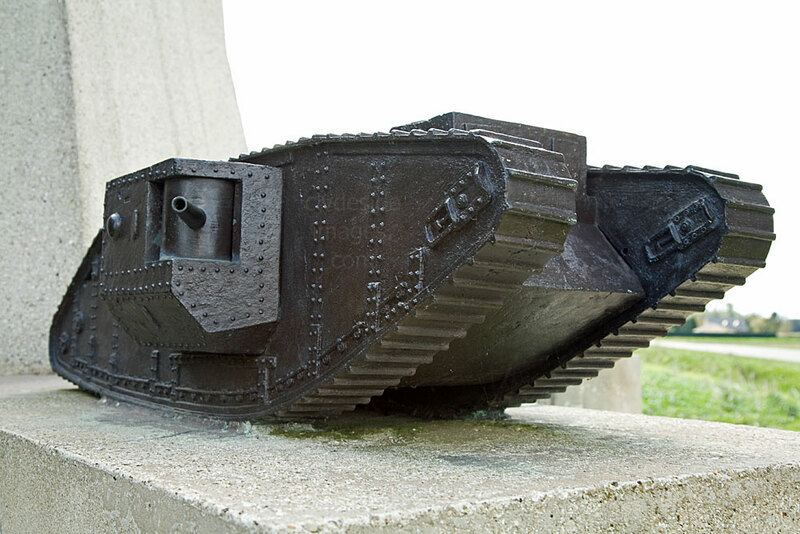 Although many of its parts came from the Mark 1 tank, the Gun Carrier bore little resemblance to its predecessor. Pictured on the left is a Carrier Mk,I `Dublin` heading to the front with its 6 inch howitzer and ammunition. 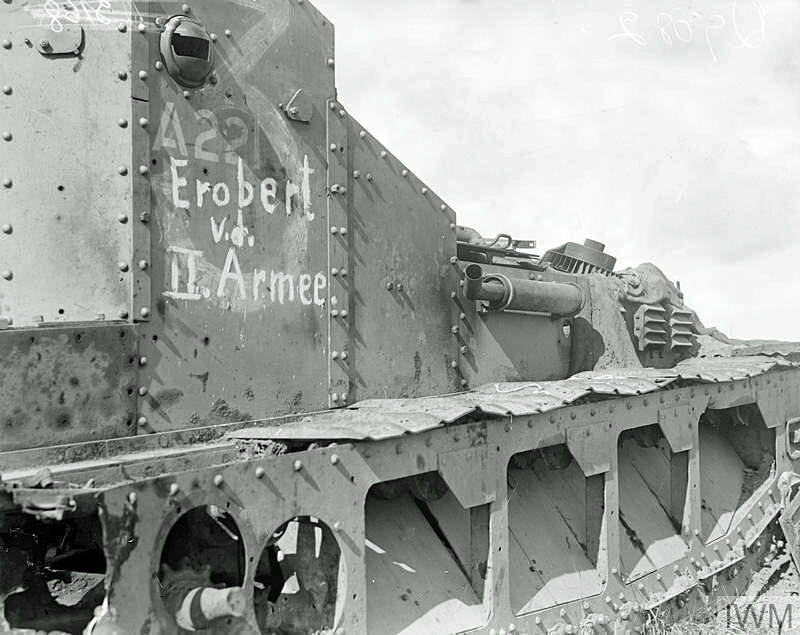 Irles, 25 August 1918. 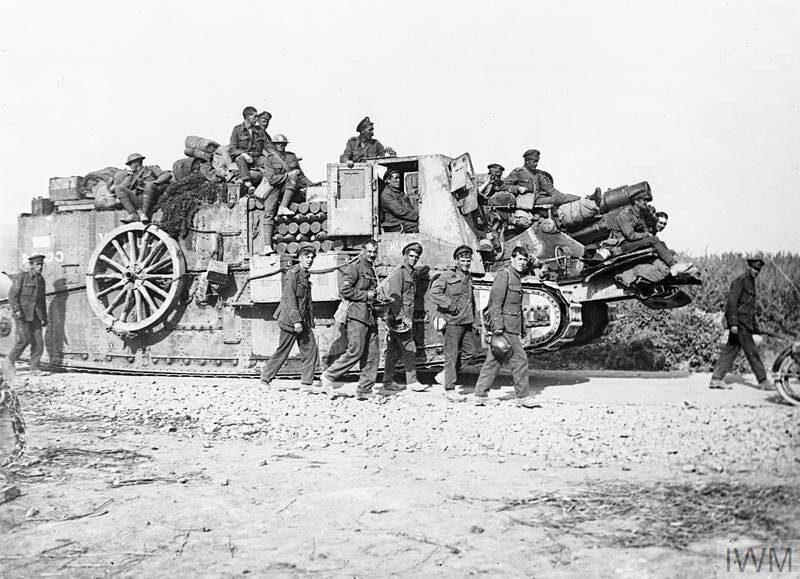 ​The Mark Is were were rarely employed as mobile artillery, mostly only being used to ferry supplies, and remained in constant use until the end of the conflict. 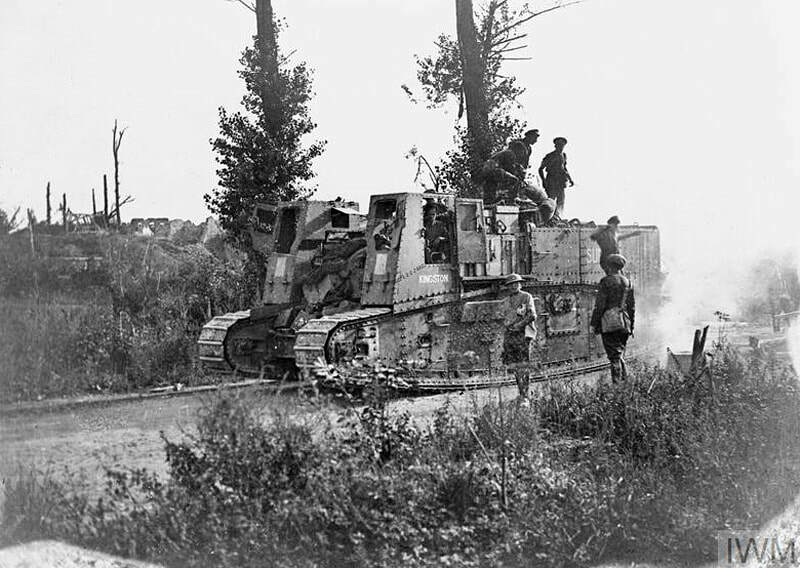 Below: British gun carrier Mk I `Kingston`, one of many used as a supply vehicle, going up to the front line near Miraumont, 25 August 1918. Two vehicles out of the order of fifty were finished as Gun Carrier Cranes, salvage tanks with a hand-operated crane in the front but without the distinctive pair of forward cabs. 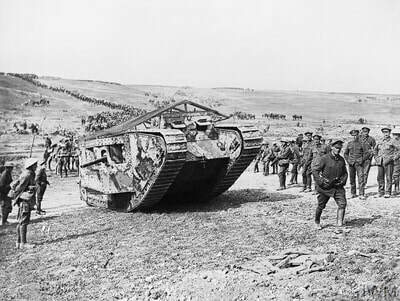 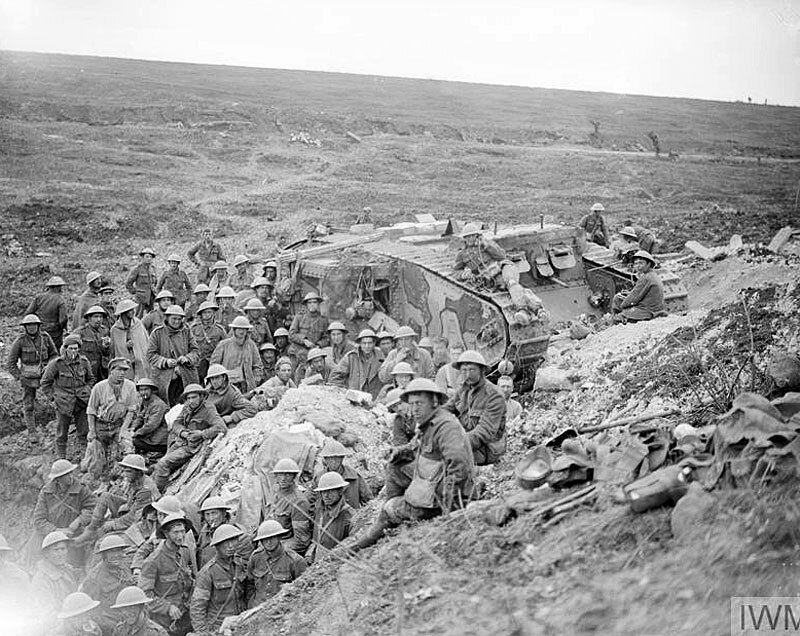 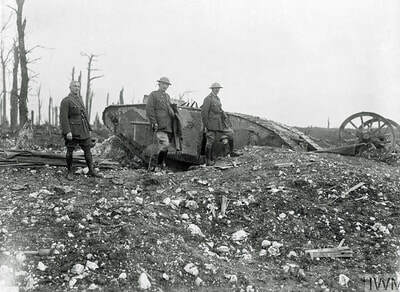 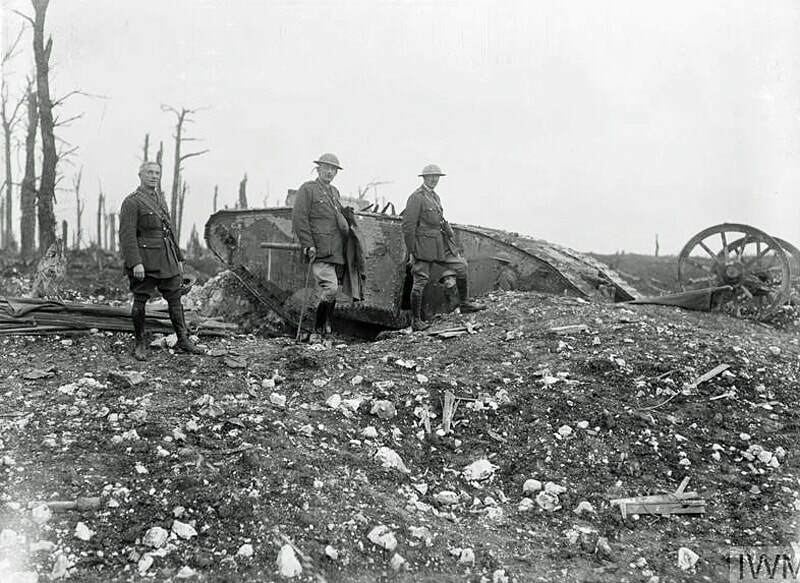 On the left is the first official photograph released of a tank going into action, taken at the Battle of Flers-Courcelette, 15th September 1916. 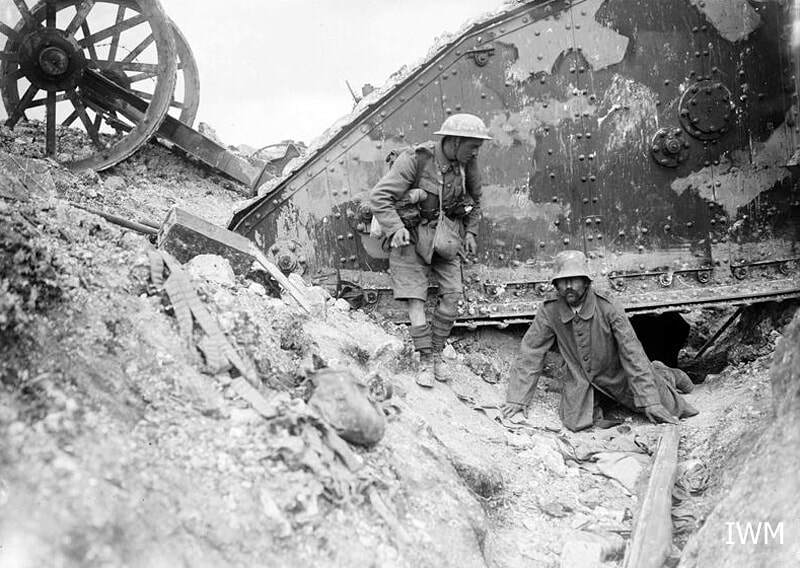 The man shown is wearing a leather tank helmet. 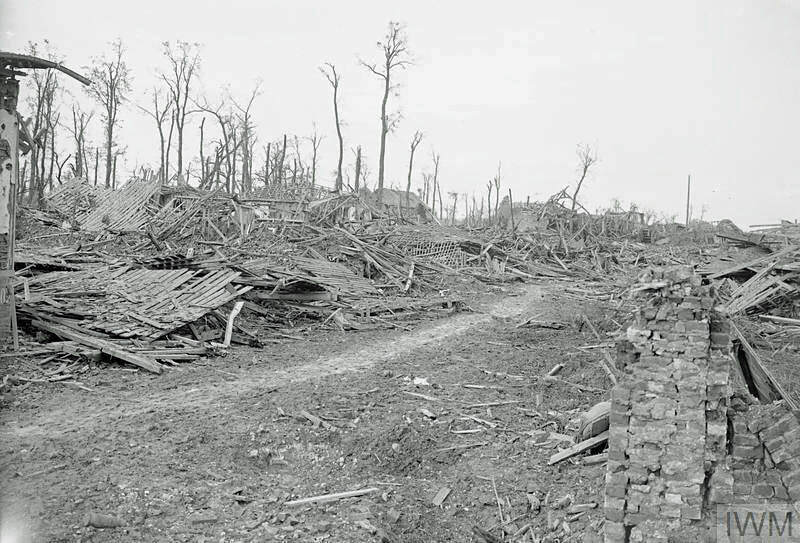 Above: All that remained of Flers main street after its capture by Allied forces on 15 September 1916. 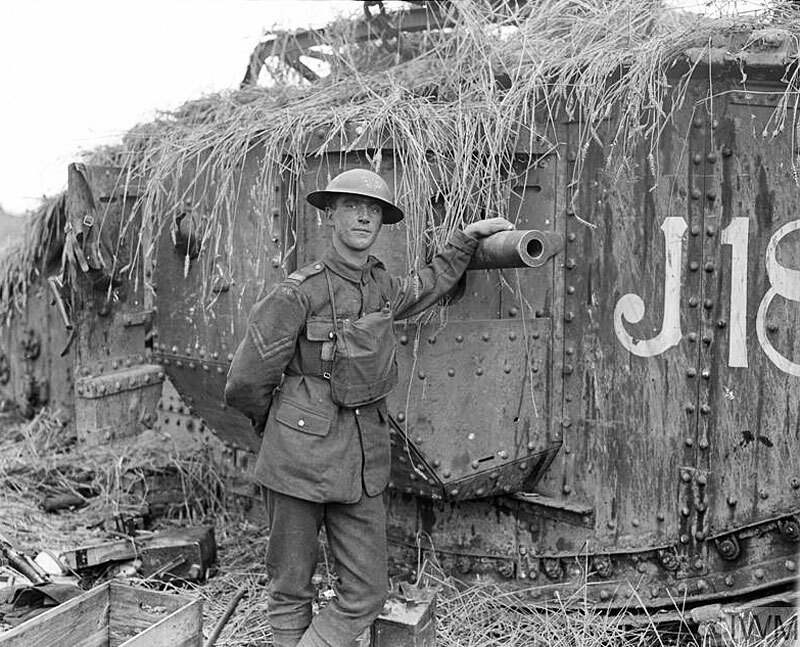 ​Left: ​A Corporal of the Tank Corps standing beside the camouflaged Mark V tank 'J18' of the 10th Battalion in a cornfield near Albert, 9 August 1918. The battalion was attached to the III Corps during the Battle of Amiens. 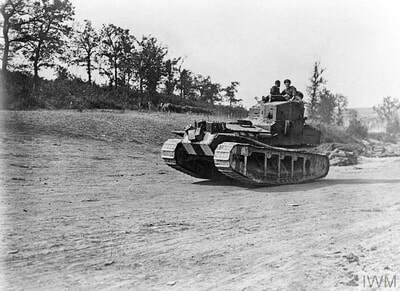 ​The Mark V was an upgraded version of the Mark IV tank, and was first used in action during the closing months of the war. They also equipped Allied forces when they intervened on the White Russian side in the Russian Civil War. 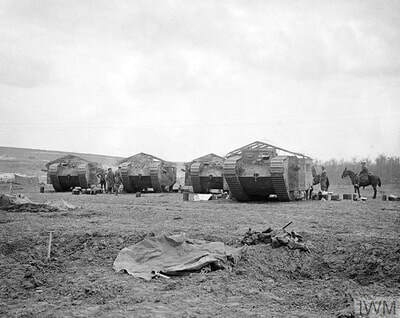 Captured machines were quickly utilised by the Red Army. 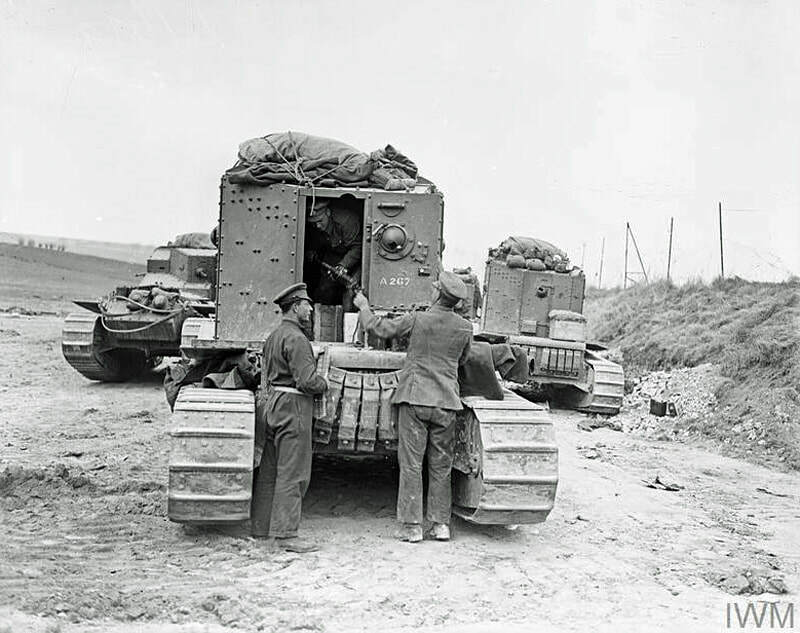 Although the Mark V was an improvement over its predecessor, chiefly with a new steering system and engine, it lacked mechanical reliability and its ventilation system was poor, causing problems for crews when inside for prolonged periods. 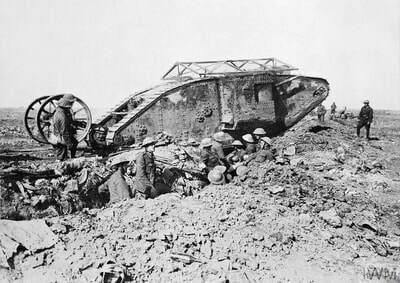 ​Below: The Medium Mark A `Whippet` tank was named after the famous breed of fast hunting dogs used for chasing down prey and catching it. The early machines had a top speed of 8.3 mph (14km/h) which made them more than twice as fast as the heavier British tanks then is service. 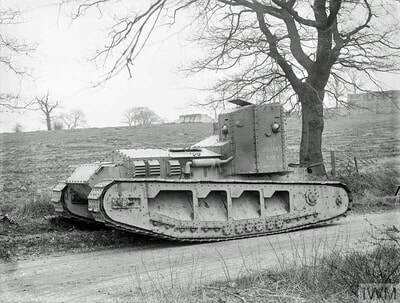 The 14 ton Whippets were designed to effectively emulate the role of scout and cavalry, exploit any breakthroughs, harass the enemy and use machine guns to sow confusion. 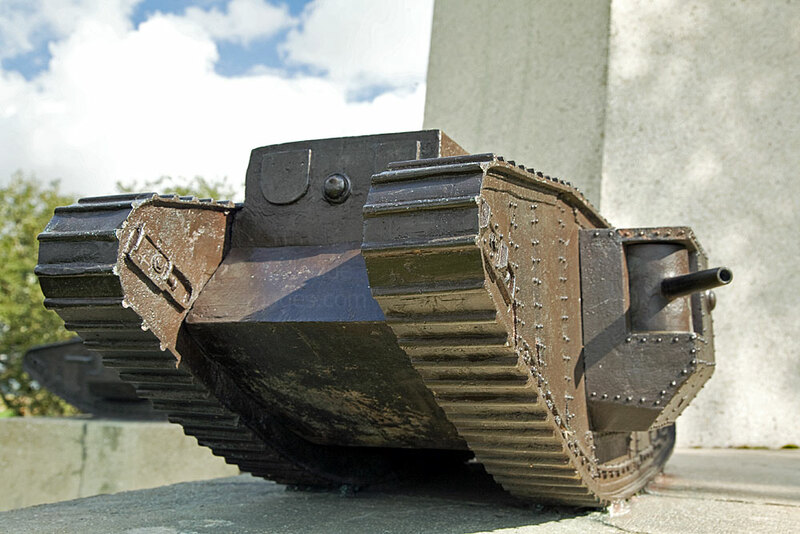 Whippets arrived late in the First World War, first going into action in March 1918, when they proved very useful in covering the fighting withdrawal of the Allied infantry divisions recoiling from the German onslaught during the Spring Offensive. Whippets were then assigned to normal Tank Battalions as extra companies. In one incident near Cachy, Somme, a single Whippet company of seven tanks wiped out two entire German infantry battalions caught in the open, killing over 400 enemy troops. 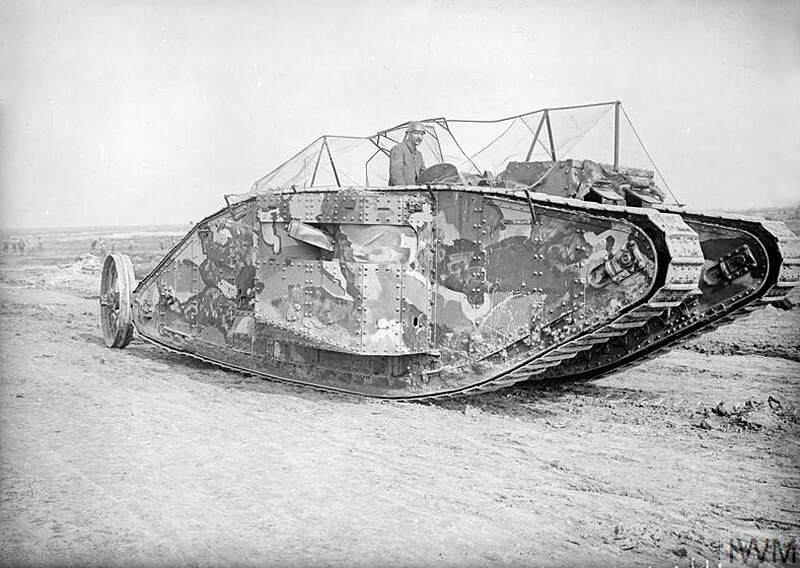 That same day, 24 April, a Whippet was destroyed by a German A7V in the world's second tank battle, the only time a Whippet fought an enemy tank. 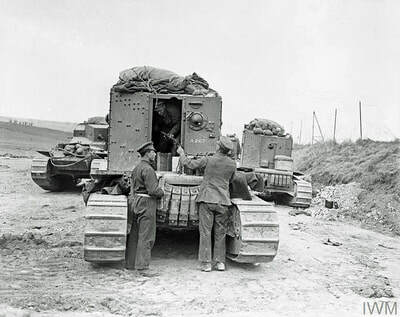 ​Whippets later took part in several of the British Army's postwar actions, notably in Ireland, North Russia and Manchuria. 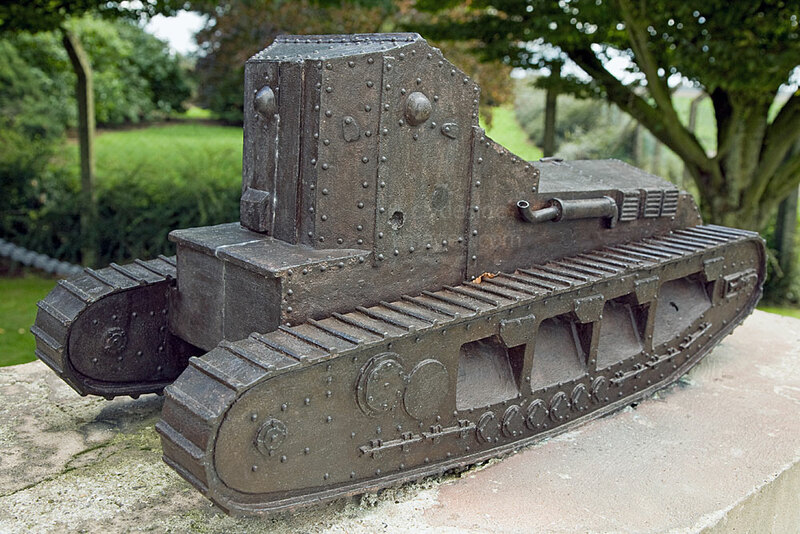 Below: This model of a French Renault FT-17 Light Tank is one of several models on display within the 1914 - 1918 Somme Trench Museum in Albert. Entering service in 1917, the FT was the first production tank to have its armament within a fully rotating turret. 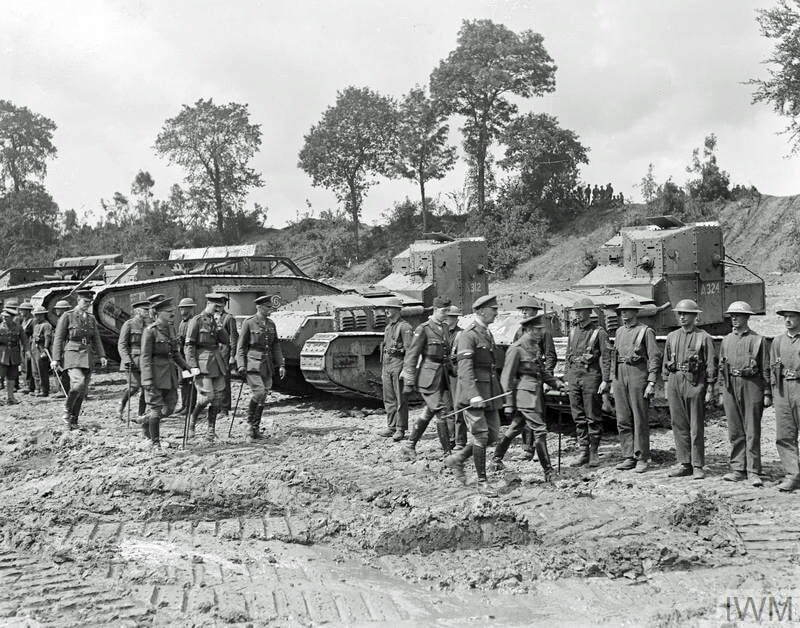 This, along with the crew compartment at the front and the engine compartment in the rear, became and remains the standard tank layout, therefore it has often been called the world's first modern tank. Over 3,000 Renault FTs were manufactured by the French during the Great War, most of them during 1918, and another 950 of an almost identical design were produced under license in the United States, but not in time to enter combat. 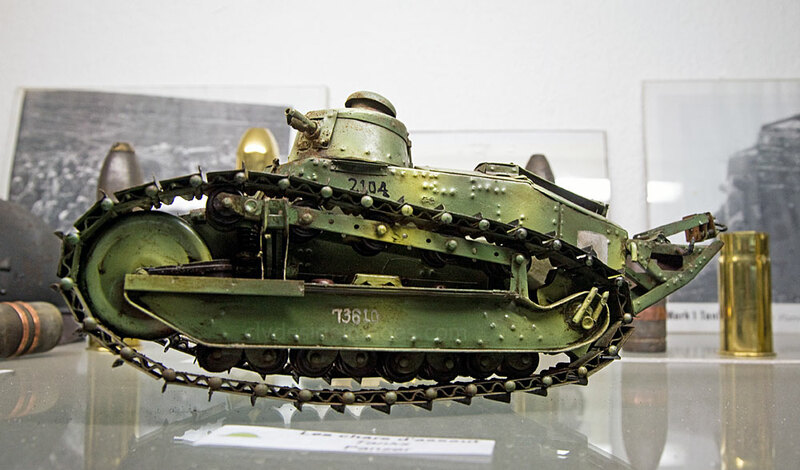 An original French Army machine can be found at the Musée de l'Armée (Army Museum) in Paris. 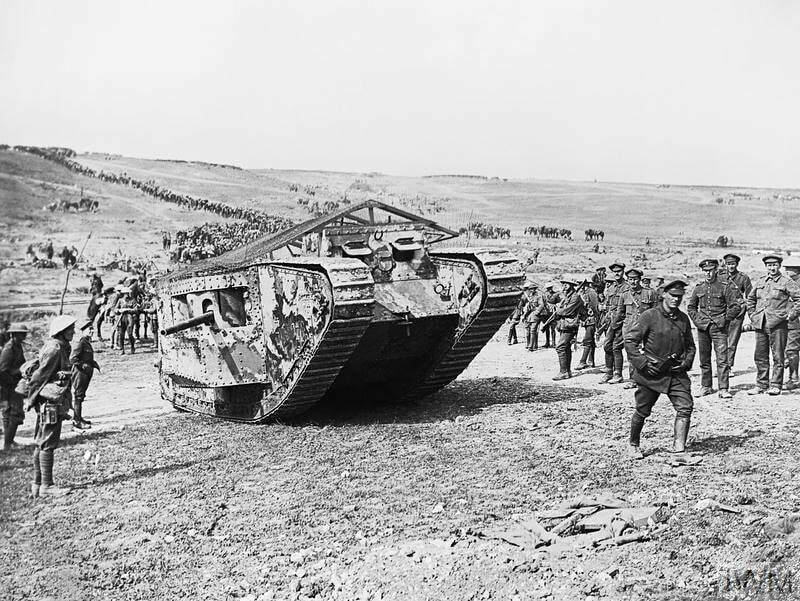 ​Earlier French tanks, the Schneider and the St Chamond had not proved successful in combat, especially compared to the first British tank designs. 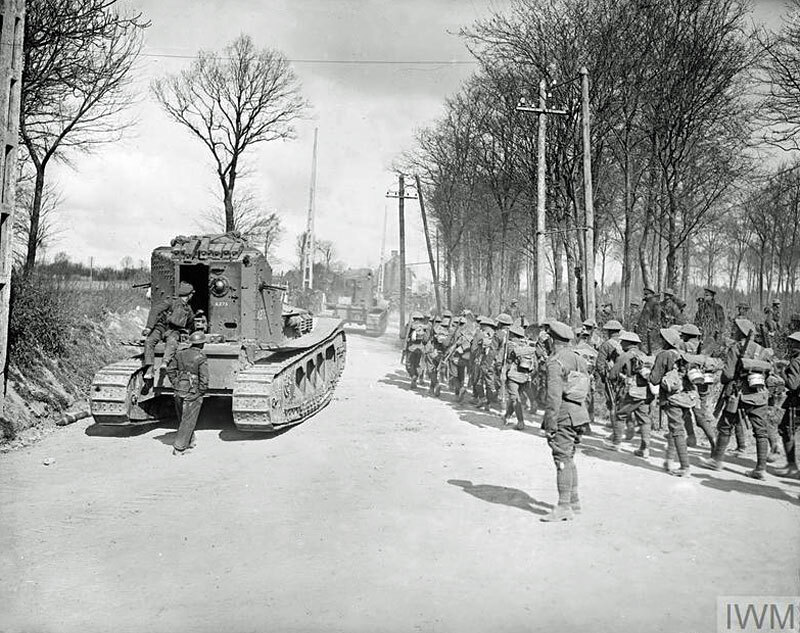 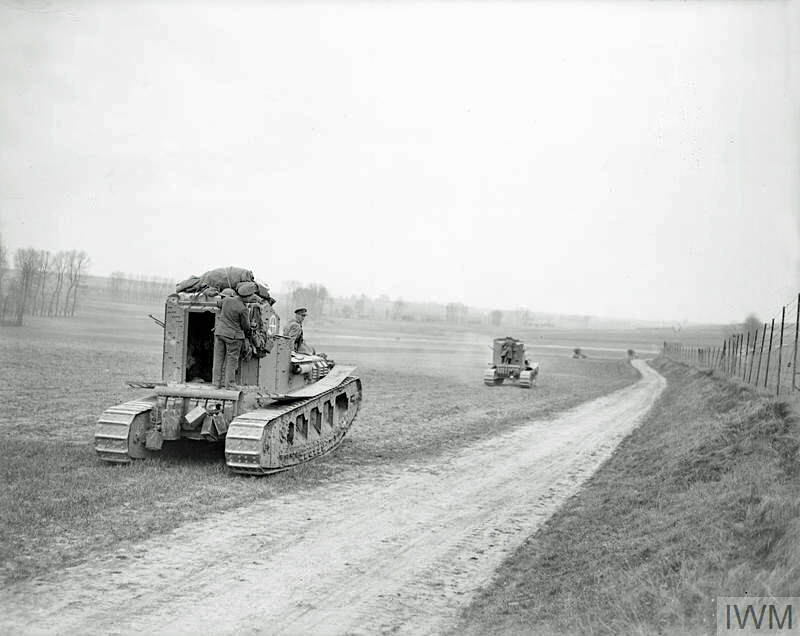 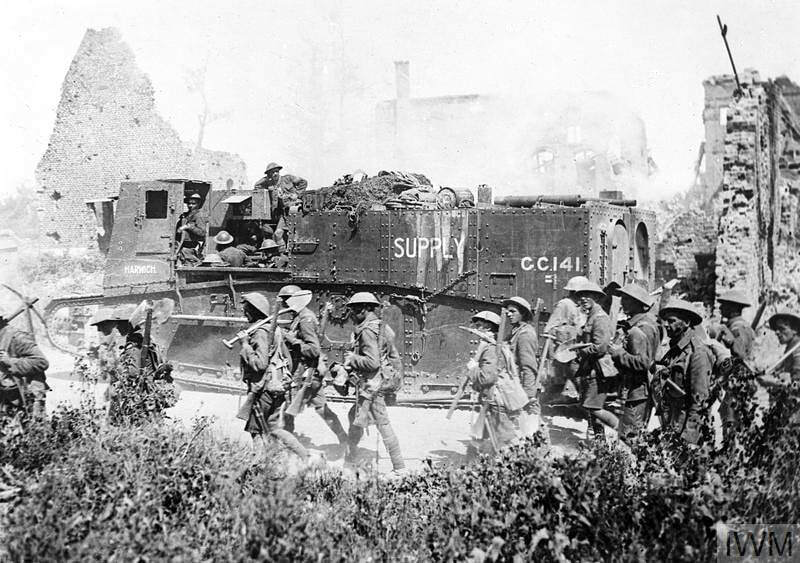 Although the British had shown that tanks can breach enemy trench lines, their machines were too heavy and slow to support rapidly advancing infantry following a breakthrough. 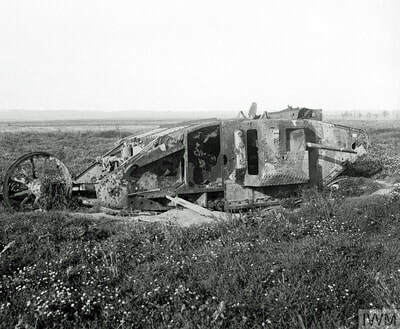 The French therefore concentrated on designing a ‘chaser’ tank. 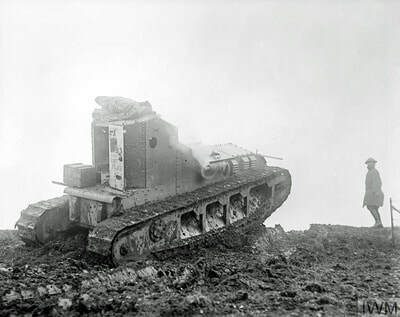 The FT-17, nicknamed the ‘Mosquito’, was designed as a cheap, easily produced machine-gun carrier that could provide direct fire-support for troops making an attack. 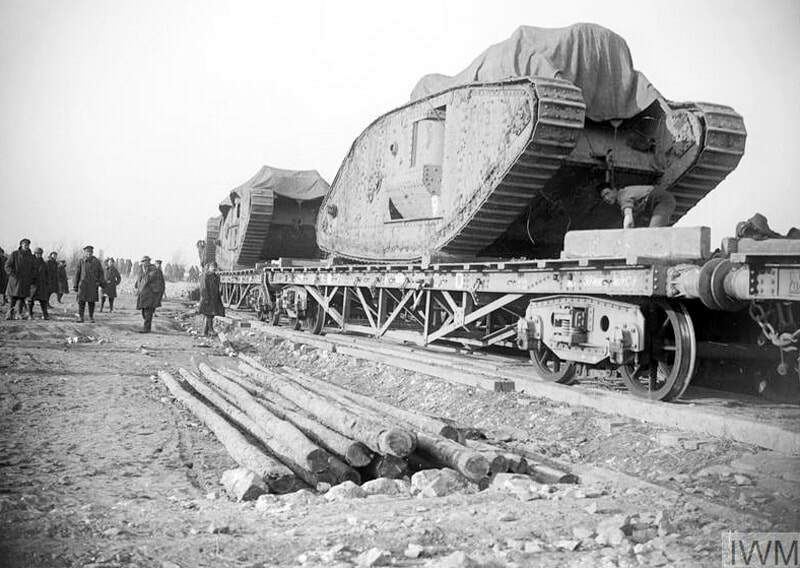 They only weighed 6 tons which meant that they could cross many bridges which would not bear the weight of the F-17`s larger and heavier British counterparts. 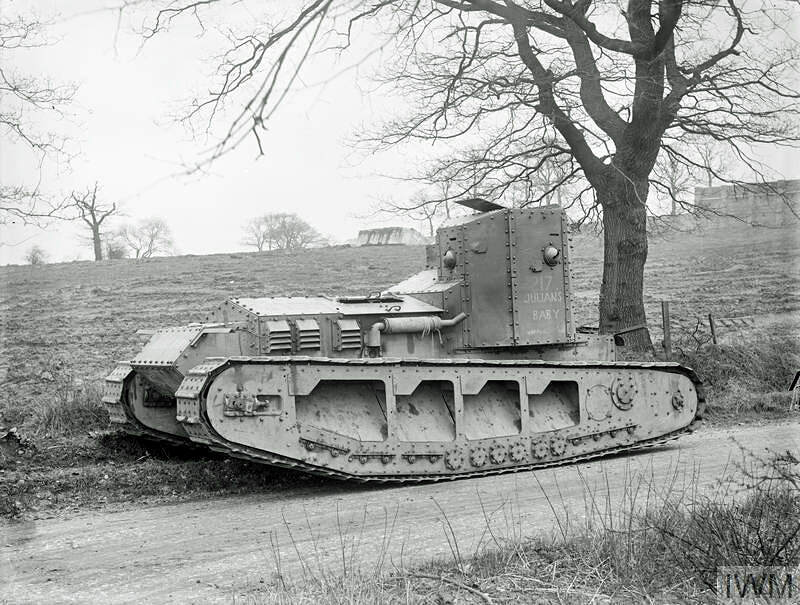 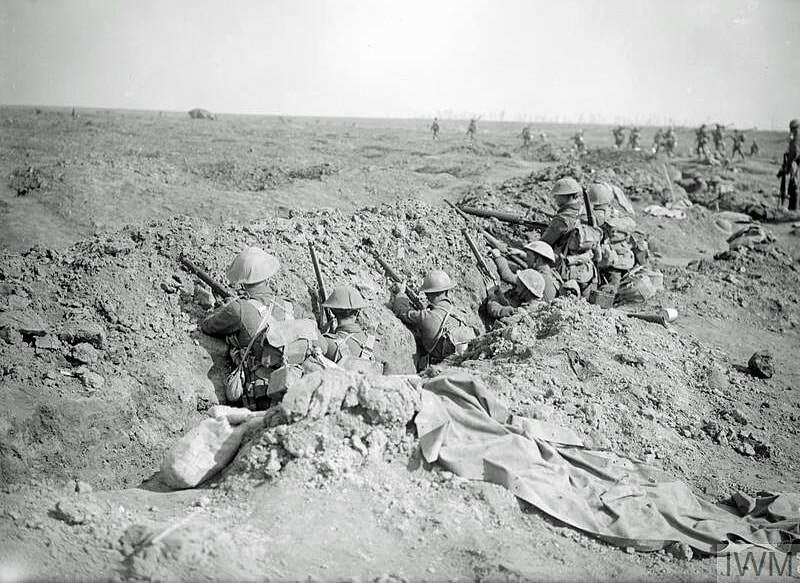 ​The metal sledge blade at the rear was designed to help with trench crossings.